DURHAM, N.C. -- The flat-screen TV on your living room wall could soon be remotely charging any device within its line of sight. Well, not your actual TV, but a device that is similar in size and shape. In a paper posted October 23, 2016 on the arXiv pre-print repository, engineers at Duke University, the University of Washington and Intellectual Ventures’ Invention Science Fund (ISF) show that the technology already exists to build such a system --it’s only a matter of taking the time to design it. Some wireless charging systems already exist to help power speakers, cell phones and tablets. These technologies rely on platforms that require their own wires, however, and the devices must be placed in the immediate vicinity of the charging station. This is because existing chargers use the resonant magnetic near-field to transfer energy. The magnetic field produced by current flowing in a coil of wire can be quite large close to the coil and can induce a similar current in a neighboring coil. Magnetic fields also have the added bonus of being considered safe for human exposure, making them a convenient choice for wireless power transfer. The magnetic near-field approach, however, is not an option for power transfer over larger distances. This is because the coupling between source and receiver—and thus the power transfer efficiency—drops rapidly with distance. 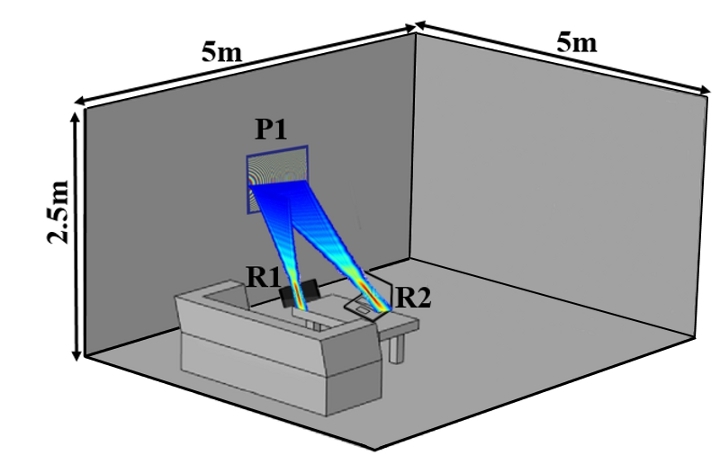 The wireless power transfer system proposed in the new paper operates at much higher microwave frequencies, where the power transfer distance can extend well beyond the confines of a room. To maintain reasonable levels of power transfer efficiency, the key to the system is to operate in the Fresnel zone--a region of an electromagnetic field that can be focused, allowing power density to reach levels sufficient to charge many devices with high efficiency. “As long as you’re within a certain distance, you can build antennas that gather electromagnetic energy and focus it, much like a lens can focus a beam of light,” explained Smith. The problem to date has been that the antennas in a wireless power transfer system would need to be able to focus on any device within a room. This could be done with a movable antenna dish, for example, but that would take up too much space, and nobody wants a big, moving satellite dish on their mantel. Another solution is a phased array --an antenna with a lot of tiny antennas grouped together, each of which can be independently adjusted and tuned. That technology also exists, but would be too costly and consume too much energy for household use. The solution proposed by Smith and his colleagues in the new paper instead relies on metamaterials --a synthetic material composed of many individual, engineered cells that together produce properties not found in nature. If this technology sounds far-fetched, it’s not. Smith and his laboratory used this principle to create the world’s first cloaking device that bends electromagnetic waves around an object held within. Several years ago, Nathan Kundtz, a former graduate student and postdoc from Smith’s group, led an ISF team that developed the metamaterials technology for satellite communications. The team founded Kymeta, which builds powerful, flat antennas that could soon replace the gigantic revolving satellite dishes often seen atop large boats. Three other companies, Evolv, Echodyne and Pivotal have also been founded using different versions of the metamaterials for imaging, radar and wireless communications, respectively. “One of the coolest things about our approach to this problem is that it allows us to manufacture our antennas at the same plants that produce LCD televisions,” said Kundtz. LCD refers to liquid crystal displays; it is the liquid crystal integrated with the metamaterial elements that enables Kymeta’s reconfigurable satellite antennas. 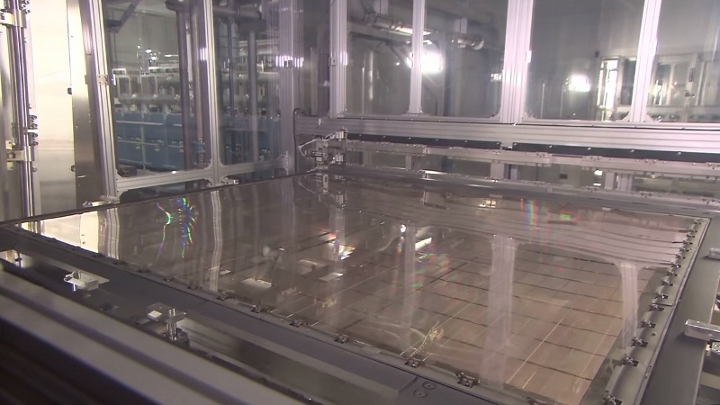 Kymeta has been producing antennas using this production capacity for about one year. In the paper, Smith and his colleagues work through calculations to illustrate what a metamaterials-based wireless power system would be capable of. According to the results, a flat metamaterial device no bigger than a typical flat-screen television could focus beams of microwave energy down to a spot about the size of a cell phone within a distance of up to 10 meters. It should also be capable of powering more than one device at the same time. "The ability to safely direct focused beams of microwave energy to charge specific devices, while avoiding unwanted exposure to people, pets and other objects, is a game-changer for wireless power," said co-author Matt Reynolds, associate professor of electrical engineering and computer science and engineering at the University of Washington. "Our proposed Fresnel-zone approach takes advantage of widely used LCD technology to enable seamless wireless power delivery to all kinds of smart devices. And we’re looking into alternatives to liquid crystals that could allow energy transfer at much higher power levels over greater distances." There are, of course, challenges to engineering such a wireless power transfer system. A powerful, low cost, highly efficient electromagnetic energy source would need to be developed. The system would have to automatically shut off if a person or a pet were to walk into the focused electromagnetic beam. And the software and controls for the metamaterial lens would have to be optimized to focus powerful beams while suppressing any unwanted secondary “ghost” beams. But the technology is there.